Regeneration of mature cells that produce functional insulin represents a major focus and a challenge of current diabetes research aimed at restoring beta cell mass in patients with most forms of diabetes, as well as in ageing. The capacity to adapt to diverse physiological states during life and the consequent ability to cope with increased metabolic demands in the normal regulation of glucose homeostasis is a distinctive feature of the endocrine pancreas in mammals. Both beta and alpha cells, and presumably other islet cells, are dynamically regulated via nutrient, neural and/or hormonal activation of growth factor signalling and the post-transcriptional modification of a variety of genes or via the microbiome to continually maintain a balance between regeneration (e.g. proliferation, neogenesis) and apoptosis. Here we review key regulators that determine islet cell mass at different ages in mammals. Understanding the chronobiology and the dynamics and age-dependent processes that regulate the relationship between the different cell types in the overall maintenance of an optimally functional islet cell mass could provide important insights into planning therapeutic approaches to counter and/or prevent the development of diabetes. Approximately one million islets are distributed throughout the pancreas of a healthy adult human, and the combined mass of the islets is ∼2 g, which constitutes between 1% and 2% of the mass of the pancreas . The islets, also termed ‘endocrine micro-organs’, comprise alpha, beta, delta, epsilon and pancreatic polypeptide hormone-producing cells. Among these, the beta cells are necessary for insulin production and the maintenance of glucose homeostasis. Current therapeutic approaches for both type 1 and type 2 diabetes are primarily focused on enhancing insulin secretion and/or insulin supplementation. Among the strategies that are continually evolving to preserve and/or replenish the functional beta cell mass, differentiation of embryonic and adult induced pluripotent stem cells in vitro  is appealing but is currently faced with limited efficiency in generating mature glucose-responsive beta cells. Other approaches include enhancing in vivo regeneration, either by improving resistance against destructive signals and apoptotic pathways or by careful and selective proliferation of existing beta cells, and differentiation and de-differentiation processes have recently been suggested to revive beta cells . In favour of the former, several factors have been described as protecting beta cells in animal models, such as hepatocyte growth factor, gastric inhibitory polypeptide (GIP), insulin-like growth factor 1 (IGF-1), and prolactin. In terms of evidence for the latter, glucagon-like peptide 1 (GLP-1), liver-derived factors  and betatrophin (also termed angiopoietin-like 8, RIFL or lipasin)  have been reported to increase beta cell proliferation. While expansion of existing beta cells in vivo has mostly been explored in rodents [6, 7], limited data from obese or insulin-resistant humans also indicate a potential for islet mass expansion. Nevertheless, it continues to be a challenge to translate current approaches used to expand beta cell mass in rodents to human islet cells even in vitro . Possible explanations for the resistance of human islet cells to proliferation include loss of expression of a key transcription factor(s) and increased expression of cell cycle inhibitors during senescence. It is notable that a renewed interest in the mechanisms that underlie defects in glucagon secretion in both type 1 and type 2 diabetes [9, 10] has prompted research into understanding the regulation of alpha cell mass and function . Indeed, several reports suggest that appropriate in vitro and in vivo factors/signals can promote the transdifferentiation of alpha cells into beta cells. The notion that alpha cells represent an in vivo source of new beta cells, is supported by (1) data from Collombat et al , who demonstrated in mice that ectopic expression of Pax4 converts progenitor cells into insulin-producing beta-like cells; and (2) lineage-tracing evidence by Thorel and colleagues  for beta cell regeneration from glucagon-producing alpha cells in a transgenic mouse model of diphtheria-toxin-induced acute selective near-total beta cell ablation. Other cell types that have been suggested as sources of beta cells in rodents include ductal or acinar cells, intra-islet precursor cells and replication of pre-existing beta cells . Studies in rodents clearly indicate that beta cell mass exhibits a remarkable plasticity to adapt, beginning in embryogenesis and continuing over a lifetime, largely in response to altered insulin demand . In this review we will focus on the chronobiology of islet cell plasticity, particularly in the context of growth factor regulation of proliferation and cell death. In rodents, the endocrine cell population undergoes a dramatic expansion beginning at embryonic day 14.5 followed by remodelling, during which there is regulated alteration in apoptosis and neogenesis and a progressive decrease in beta cell replication . Insights into the normal development of the pancreas have emerged from observations made from late gestation throughout the neonatal period in a non-human primate model (see text box: ‘Age-dependent changes in islet morphology in non-human primates’). Pancreases from fetal/newborn baboons reveal that the islet architecture becomes more organised as gestational age advances. Thus, in early life, the total per cent of endocrine cell area, expressed as a percentage of total pancreas area, is greater than in adults, with no prevalence of any endocrine cell type. However, endocrine cells, as well as cells with mixed endocrine–exocrine lineage, were also detected in exocrine ductal and acinar cells in fetuses . The Notch pathway has been considered a major regulator during pancreas development in both humans and rodents ; cells in which the pathway is activated maintain their proliferative capacity, while those that do not express neurogenin 3 exit the cell cycle and differentiate into endocrine cells. Consistently, a mouse model with impaired Notch signalling exhibits increased endocrine cell differentiation at the expense of the pancreatic progenitor population . In humans, a high rate of proliferation characterises late embryogenesis  and begins to decline postnatally [16, 21]. Specifically, proliferation of insulin-expressing cells occurs at relatively high rates during early development and decreases to low levels by 24 weeks [22, 23]. Analysing human pancreatic samples using Ki67+ insulin-expressing cells, Gregg et al  detected a high level of beta cell proliferation in neonates and in children of up to about 2 years of age that has been considered responsible for doubling human beta cells by 5 years of age to establish an organism’s beta cell mass. Studies in genetic mouse models indicate the different regulators determine embryonic vs postnatal beta cell proliferation . For example, D and E cyclin–cyclin-dependent kinase (CDK) complexes regulated by CDK inhibitors, including p27kip1 and p16cip1, play a critical role in progression of the cell cycle from G1 to S phase in the postnatal period . Mouse models cyclin D2 or CDK4 knockout or overexpression of p27kip1 exhibit relatively normal islet structure, composition and mass in the neonatal stages, but manifest adult-onset diabetic phenotypes, suggesting that cell cycle regulators contribute to adaptation of islet function in the post-neonatal stage. Forkhead box protein (FOX)M1 has been investigated using a pancreas-specific knockout mouse. While whole pancreas deletion of FOXM1, a key cell cycle regulator of both G1/S progression and G2/M transition, does not affect embryonic pancreas development, it leads to impaired postnatal beta cell mass expansion via reduced proliferation. These studies suggest that cell cycle regulators are unlikely to be critical for endocrine progenitors and/or beta cell proliferation during embryogenesis, and that the mechanisms necessary for embryonic beta cell replication are likely to differ from those in adults . In addition to regulating insulin secretion, the alpha cell hormone, glucagon, has been suggested to affect the development of beta cells  and regulate islet microcirculation . Altered alpha cell function in mice, secondary to alpha cell-specific knockout of insulin receptors (alpha-IRKO), has been reported to either directly or indirectly influence beta cell proliferation in the mutants . Lack of glucagon itself is reported to induce alpha cell hyperplasia . Mice with disruption of prohormone convertase 2, which is essential for processing proglucagon into the mature hormone, glucagon, display increased proliferation of proglucagon cells in the perinatal period and a dramatic postnatal alpha cell hyperplasia and mild hypoglycaemia . Notably, mice with alpha cell-specific mutated menin exhibit an increased frequency of glucagonomas, insulinomas and mixed islet tumours, arising from cells expressing the proglucagon gene; pointing to menin as an in vivo regulator of alpha cell plasticity, growth and transdifferentiation . Glucagon-expressing cells can indeed transdifferentiate into insulin-expressing cells upon menin inactivation, suggesting that alpha cells are more plastic than previously appreciated. However, Wilcox et al  reported that ablation of the Arx gene in neonatal alpha cells results in loss of glucagon expression and conversion of this cell population to adopt an insulin-producing beta cell fate. The transcription factor encoded by the Arx gene, which is expressed in a subset of endocrine progenitors and restricted to alpha cells [33, 12], is involved in the specification and maintenance of alpha cell fate. It is logical that adequate nutrition during embryogenesis is necessary to ensure appropriate development of beta cell mass. Nutritional insults that occur during early life may result in decreased beta cell mass and function that persist in adulthood to promote increased risk of glucose intolerance and type 2 diabetes . Maternal restricted energy intake during parturition and the consequent increased levels of glucocorticoids  have been reported to decrease fetal beta cell mass as a result of reduced differentiation and decreased beta cell expression of the key transcription factors pancreatic and duodenal homeobox 1 (PDX1), paired box protein 4 (PAX4) and NK6 homeobox 1 (NKX6.1). A maternal diet low in protein content causes intrauterine growth retardation, and the newborn rodents exhibit underdeveloped beta cell mass owing to reduced proliferation and increased apoptosis associated with reduced levels of growth factors . Protein restriction during pregnancy has also been associated with impaired beta cell replacement after streptozotocin treatment . Maternal malnutrition can also alter the development of tissue vasculogenesis in the offspring, which may limit beta cell plasticity by disrupting the inductive signals from the microvasculature and an altered presence of endothelial progenitors . Offspring of pregnant rats fed a low-protein diet during gestation exhibit a reduced capillary density in the islets . In summary, nutritional insults can directly impact beta cell plasticity by effects on progenitors and the function of mature beta cells, and may also have indirect effects resulting in impaired trophic signalling between the vascular endothelium and beta cells . The incidence of both type 1 and type 2 diabetes has increased over the past decade, and the increase in the latter has been attributed to obesity, insulin resistance and deficient beta cell function . A pubertal increase in insulin resistance and an inability to mount an adequate beta cell insulin response results in hyperglycaemia. Intensive glycaemic regulation may allow for beta cell recovery in children  and is suggestive of plasticity of islets during this developmental stage. Hormonal changes related to puberty, along with race and genetic factors, has been recognised as a non-modifiable risk factor underlying the increased incidence of type 2 diabetes among adolescents [42, 43]. The transient insulin resistance of puberty  that is associated with a compensatory increase in insulin secretion  might accelerate progression of beta cell failure because of the additional stress on insulin-producing cells during crucial periods of growth and development, but the mechanism(s) contributing to the resistance has not been clearly determined. The hypothesis that reduced insulin sensitivity is driven by transient changes in growth hormone levels during puberty  is attractive, since growth hormone and IGF-1 levels are transiently higher in mid-puberty and mirror the changes in insulin sensitivity . In addition, growth hormone-deficient children exhibit increased insulin sensitivity , and growth hormone is known to significantly affect beta cells . Difficulty in designing approaches to easily and accurately measure beta cell mass in vivo has precluded a clear understanding of the precise changes that occur in the endocrine pancreas during the transition from childhood through to adulthood. Available data are derived from autopsy studies, including those by Butler and colleagues [50, 51], who measured pancreas volumes for 46 individuals aged from 2 weeks to 21 years using abdominal computerised tomography. These data indicate that beta cell mass expands by several fold from birth to adulthood, with the largest increment occurring prior to 2 years of age [21, 52]. This increase in islet mass is secondary to a greater number of beta cells per islet and increased islet size rather than an increase in the number of islets or alterations in apoptosis during the pancreatic remodelling phase. Thus, early childhood has been identified as the period with the most rapid expansion of beta cell numbers, while the rate of growth and the replication of existing beta cells decline from youth through to adulthood. A study using histological approaches reported beta cell neogenesis and a regenerative response in children and adolescents with type 1 diabetes . In the same study, proliferation was detected in the remnant beta cell mass in those with new-onset type 1 diabetes but not in those with type 2 diabetes (Fig. 1). The presence of a functional islet mass that is optimal for the different stages of the lifespan of an organism depends on multiple regulatory processes. Under normal circumstances, islet mass is relatively stable, with the cells undergoing a slow renewal because of low levels of proliferation and apoptosis. Diverse regulatory factors include hormones, metabolites and growth factors which have all been proposed to modulate islet cell mass by direct or indirect effects. For example, growth factors including IGF-1 and IGF-2, insulin, platelet-derived growth factor (PDGF), epidermal growth factor (EGF) and others  exert a direct stimulatory effect on beta cell replication in vivo or in vitro . As discussed in the ‘Prenatal and neonatal period’ section, several genetic mouse models of cell cycle dysregulation manifest an adult-onset diabetes phenotype, characterised by decreased beta cell mass via reduced proliferation. This suggests that mature beta cells are sensitive to perturbations in cell cycle control, and this is probably due to differential involvement of cell cycle regulators compared with most other cell types as exemplified by models lacking CDK6  and/or redundant expression of cyclin D2 [57, 58]. Furthermore, overexpression of the inhibitor p27kip1  in beta cells impairs proliferation, resulting in reduced beta cell mass. In contrast, global deletion of p27kip1 enhances beta cell proliferation, as also observed in genetic mouse models of insulin resistance (e.g. IRS2 KO, db/db) . Beta cell hyperplasia is also observed in humans with a focal loss of heterozygosity of p57kip2, who suffer from hyperinsulinism of infancy . Considering that mice with pancreas-specific knockout of FOXM1 leads to impaired alpha and beta cell proliferation and impaired beta cell mass regeneration after partial pancreatectomy, it is possible that FOXM1 is required for beta cell proliferation and hyperplasia of pre-existing beta cells following injury . Recent studies point to FOXM1 being involved in the adaptive response of the beta cells to alterations in nutrients . Thus, FOXM1 is critical for maintaining beta cell mass during adulthood by coordinating cell cycle progression. Another regulator of cell cycle genes is menin ; beta cell-specific deletion of menin leads to beta cell hyperplasia and insulinomas owing to increased proliferation secondary to reduced levels of p18 and p27kip1 . Al-Hasani et al  recently reported that upon Pax4 misexpression, adult alpha cells are converted into insulin-producing cells, independent of their age, mutation state or microenvironment. They also report a duct cell to beta-like cell regeneration pathway that could be repeatedly activated by streptozotocin injury in an age-dependent manner. The newly formed beta cells are functional and able to repopulate and increase the size of islets (see text box: ‘Contributors to maintenance of islet cell mass in adult rodents’). Genetically engineered knockout and transgenic mouse models and knockdown approaches targeting one or more proteins in the insulin/IGF-1 signalling pathway, including the insulin and IGF-1 receptors [66, 67], IRS-1 and IRS-2 [68, 69], Akt , phosphoinositide 3-kinase (PI3-kinase)  or FOXO1 , point to their significant roles in the regulation of islet biology. Several groups, including ours, have reported on the significance of insulin/IGF-1 signalling in the regulation of both beta and alpha cells [66, 28]. A role for insulin signalling in the regulation of alpha cell function and mass is evident from analyses of alpha-IRKO mice . Interestingly, the mutant mice exhibited hyperglucagonaemia, glucose intolerance and an age-dependent progressive increase in beta cell area, while alpha cell area was unchanged leading to a decrease in relative alpha cell area . The reduced relative alpha cell area in older alpha-IRKO mice may be secondary to attenuation of insulin signalling-mediated anti-apoptosis leading to increased alpha cell death. In humans, an increase in alpha cell relative area has been reported in insulin-resistant patients  and in patients with type 2 diabetes  or type 1 diabetes ; however, the mechanism(s) underlying this apparent increase in alpha cell mass remains unclear. Disruptions in glucagon signalling induced in animal models by decreasing glucagon receptor (GR) expression [29, 76] or modulating proteins in the receptor signalling pathway  determine alpha cell hyperplasia. Studies on these disruptions suggest that, similar to the observations on beta cell hyperplasia in insulin resistance, an increase in alpha cell proliferation and hormone production occurs in states of glucagon resistance. In addition, the contribution of hyperinsulinaemia to alpha cell hyperplasia is supported by observations that IRS2 KO mice exhibit reduced alpha cell mass and glucagon secretion , while in vitro insulin treatment of alpha TC1 cells leads to increased alpha cell proliferation by triggering mTOR . Among alpha cell regulators, recent findings suggest that a circulating factor, which is likely to be generated following disruption of hepatic GR signalling, can increase alpha cell proliferation independent of direct pancreatic input . Thus, despite preservation of islet GR signalling, GRHep−/− mice develop hyperglucagonaemia and alpha cell hyperplasia. Identification of novel factors regulating alpha cell proliferation and mass may facilitate the generation and expansion of alpha cells for transdifferentiation into beta cells and the treatment of diabetes. Studies in adult baboons indicated an obesity-induced increase in alpha cell mass that was significantly greater than the increase in beta cell mass, leading to an imbalance in the beta:alpha ratio. The authors suggest that an abnormal activation of IL-6 and TNF-α signalling systems is associated with the increased alpha cell mass  (see text box: ‘Contributors to maintenance of islet cell mass in adult rodents’). In addition to being an essential nutrient as a primary energy source in the body, glucose has an effect on islet cell population dynamics. For example, in rats, glucose infusion increases beta cell numbers by 50% , with neogenesis of precursor cells being a dominant contributor to the increased mass . Furthermore, glucose promotes beta cell survival by suppressing a constitutive apoptotic programme in vivo , and there is evidence that chronic changes in beta cell glucose metabolism induced by genetic or pharmacological manipulation of glucokinase can regulate beta cell mass regeneration in vivo . Paradoxically, chronic hyperglycaemia promotes glucotoxicity which, in turn, exacerbates diabetes by increasing apoptosis . Although it is now several decades since the concept of glucose toxicity  was first introduced, the precise cut-off point at which glucose levels transition from being useful and supportive of proliferation to assisting in the apoptosis and destruction of beta cells has still not been defined. Excessive nutrient intake, such as high-protein  or high-fat diets , has also been described as modulating beta and alpha cell morphology. Increased levels of IL-6 in type 2 diabetes coupled with high expression of IL-6 receptors on alpha cells suggest that this cytokine could contribute to the increased alpha cell mass observed in diabetes . This notion is supported by fasting hypoglucagonaemia and an inability of mice lacking IL-6 to increase their alpha cell mass. miRNAs are powerful regulators of growth, differentiation and organ function and act by modulating gene expression at the post-transcriptional level . The expression of several miRNAs is affected by prolonged exposure to elevated concentrations of glucose, NEFA and proinflammatory cytokines . Moreover, alterations in the expression of several islet miRNAs have been reported in different models of diabetes [91, 92]. As recently proposed by Nesca et al , obesity and insulin resistance trigger changes in the levels of miR-132, miR-184 and miR-338-3p, which promote beta cell mass compensation. However, the authors also suggest that compensation failure further modifies the expression of additional miRNAs (e.g. miR-21, miR-34a, miR-199a-5p, miR-199a-3p, miR-203, miR-210, miR-383), with consequent negative effects on beta cell biology. Recently, miR-184 has been reported to be reduced in islets from type 2 diabetes patients. Poy and colleagues report that the reduced miR-184 promotes expression of Ago2 to form the microRNA-induced silencing complex in the regulation of beta cell proliferation . Additional research is necessary to carefully dissect the interactions and hierarchy of miRNAs in the regulation of compensatory beta cell proliferation. Among other miRNAs, miRNA-7a  has been reported to limit adult beta cell proliferation by inhibiting mammalian target of rapamycin (mTOR) signalling. Mice lacking miR-375 exhibit reduced beta cell mass as a result of impaired proliferation, hyperglucagonaemia and increased alpha cell numbers suggesting regulation of both beta and alpha cells . 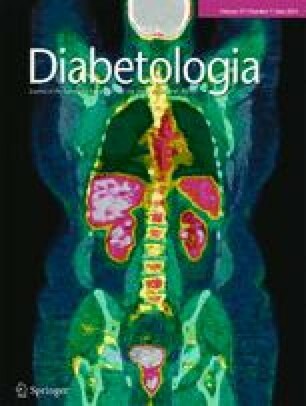 Genetic deletion of miR-375 in ob/ob mice profoundly diminished the proliferative capacity of the endocrine pancreas and resulted in a severely diabetic state, indicating a role for the miRNA in beta cell compensation . During pregnancy, placental hormones, particularly placental lactogen, are responsible for alterations in beta cell mass. These hormones stimulate beta cell proliferation in isolated islets, and beta cell mass is reduced by up to 42% in receptor-deficient mice . It has recently been demonstrated that the pro-survival effects of lactogens are mediated by protection against apoptotic pathways controlled by members of the BCL2 gene family in human beta cells  and against glucolipotoxicity-induced cell death via Janus kinase 2 (JAK2)/signal transducer and activator of transcription 5 (STAT5) signalling . While in vitro studies have demonstrated that human somatomammotropin stimulates glucagon release , in vivo studies in both rats and humans suggest that pregnancy does not affect alpha cell function  and that alpha cells might not be involved in the increased insulin demand in response to insulin resistance during normal human pregnancy . Gastrointestinal hormones have long been recognised as regulating islet mass. GLP-1, GIP, cholecystokinin and gastrin are all secreted in response to nutrient intake and act to regulate digestion, insulin secretion, satiety and beta cell mass. GLP-1 promotes beta cell proliferation, islet neogenesis and beta cell survival in vivo , while GIP promotes beta cell survival in vivo but only promotes beta cell proliferation in vitro . Cholecystokinin regulates beta cell apoptosis and mitogenesis in vivo in rats , and gastrin stimulates islet neogenesis . The mechanism(s) adopted by GLP-1 and GIP to modulate cell proliferation and function implicates multiple signalling pathways. The pathways characterised include those acting via the G-protein-coupled receptors that lead to activation of cAMP, protein kinase A (PKA) and the cAMP response element-binding protein (CREB) cascade to directly regulate genes involved in proliferation and apoptosis, and other pathways determining phosphorylation of Akt and mitogen-activated protein kinases . The ghrelin gene-derived peptides and exendin-4 exert cyto-protective effects in human pancreatic islet endothelial cells. These anti-apoptotic effects involve the phosphoinositide 3-kinase [PI3K]/Akt, extracellular signal-regulated kinase1/2 (ERK1/2) and cAMP/PKA pathways . Although ageing is characterised by a low level of beta cell proliferation, mice treated with exendin-4 at different ages show low glucose levels, suggesting a potential beneficial effect in ageing . The C-terminal VGF peptide, TLQP-21, potentiates glucose-stimulated insulin secretion in isolated rat islets and reduces glycaemic excursion in Wistar rats following a glucose challenge. Chronic administration of TLQP-21 to Zucker diabetic fatty rats delays the onset of overt diabetes by preserving islet cell mass  and acts in a manner similar to exendin-4 by blocking beta cell apoptosis. GLP-1 and GIP exert opposing actions on glucagon secretion. Thus, GLP-1 receptor agonists and dipeptidyl peptidase 4 (DPP4) inhibitors inhibit glucagon secretion , while GIP has been shown to increase glucagon secretion in humans under hyperglycaemic conditions . As extensively reviewed by Drucker , the precise effects of GLP-1 on alpha cell mass are still unclear. The recent report of alpha cell hyperplasia in pancreases from diabetic patients treated with GLP-1 receptor agonists and DPP4 inhibitors without evidence for alpha cell proliferation are difficult to interpret . The latter study  has been a matter of considerable debate since the data indicate the opposite of several preclinical studies in rodents and non-human primates, wherein the use of different drugs and experimental models did not lead to detectable alpha cell hyperplasia, and in fact showed reduced numbers of alpha cells [116, 117]. Thus it is unclear how GLP-1 ‘directly’ regulates alpha cell hyperplasia independent of evidence of proliferation. In this context, it is notable that GR disruption increases alpha cell mass  by increased proliferation independent of GLP-1 receptor signalling . The endocrine compartment of the pancreas is relatively well maintained with advancing age , and studies indicate that beta cell mass remains relatively constant from age 20 to 100 years in healthy humans, with no major alterations in cell size and apoptosis, suggesting that the cells are likely to be long lived . The Harlan and Tisdale groups used two intriguing techniques to study human beta cell turnover in vivo: (1) iododeoxyuridine (IdU) or bromodeoxyuridine (BrdU) staining in pancreases from autopsies performed on patients who, under clinical protocols, were administered the thymidine analogue; and (2) the technique of carbon-14 dating of DNA extracted from beta cells isolated from recently deceased donors. The two groups suggested that human beta cell turnover is limited to the first three decades of life, since no replication (incorporation of IdU) of islet beta cells was detectable in the participants over 30 years of age . Age-dependent alterations in cell cycle protein expression in islet cells include an increase in p16cip1 levels  and a reduction in centromere protein A (CENPA) , a protein required for chromosomal segregation in mitosis. Among other factors, alterations in the rates of apoptosis and amyloid deposition and an imbalance between activation and inactivation of cell cycle proteins have all been topics of debate with regard to their contribution to the pathogenesis of type 2 diabetes. When evaluating islet plasticity it is important to consider the rate of cell death. A systematic analysis of autopsied pancreases from humans at different ages suggested that beta cell apoptosis is low and remains constant throughout life . However, the apoptotic rate has been reported to be increased in obese and diabetic individuals compared with the rate in lean and non-diabetic groups . In contrast, a study by Reers et al showed that a decline in beta cell replication with age was not associated with a change in the frequency of apoptosis . The increase in the apoptotic rate has been explained, in part, by the accumulation of amyloid plaques , aggregates of islet amyloid polypeptide (IAPP, a hormone co-secreted with insulin), which are increased in islets of diabetic and obese non-diabetic individuals. Since rodent IAPP does not aggregate because it has a different structure to the human hormone, investigators have examined the effects of IAPP accumulation in islets in transgenic mice expressing human IAPP. Overexpression of human IAPP has been reported to cause early hyperglycaemia followed by accumulation of amylin plaques in the islets in ageing mice . Janson et al  reported that intermediate-sized amyloid particles in human islets promote membrane damage and subsequent cell death (Fig. 2). Similar to humans, islet amyloidosis was observed in a large number of baboons with normal fasting plasma glucose levels and in those with impaired fasting glucose or type 2 diabetes. Ageing was positively correlated with the severity of islet amyloidosis, and increased amyloidosis was associated with an increased rate of alpha cell replication and beta cell apoptosis . Studies in murine models suggest that mature beta cells are sensitive to cell cycle perturbations. Specifically, the products of the Ink4a/Arf (Cdkn2a) locus, p16cip1 and p19, the expression of which increases with age , have been associated with reduced beta cell proliferation . In this context it is notable that genome-wide association studies in humans link the CDKN2A locus to type 2 diabetes susceptibility [131, 132, 133, 134], providing physiological relevance. Epigenetic regulation of the CDKN2A locus determines a series of histone modifications to control beta cell proliferation during ageing. In particular, ageing de-represses this locus, leading to increased levels of cell cycle inhibitors (p16cip1 and p19), decreased B-lymphoma Moloney murine leukaemia virus insertion region-1 (BMI1) banding  and decreased levels of enhancer of zeste homologue 2 (EZH2) , a histone methyltransferase and member of the polycomb group of proteins. Other stressors that influence the biology of the ageing beta cell, a major secretory cell include endoplasmic reticulum (ER) and oxidative stress. As an adaptive response to ER stress, pancreatic beta cells express high levels of the transducers inositol-requiring enzyme 1 (IRE1), PKR-like ER kinase (PERK) and activating transcription factor-6 (ATF6), which balance the protein synthesis and ER folding capacity of the cells. Despite an increase in unfolded protein response (UPR) signalling, which allows proinsulin synthesis by increasing the ER folding capacity after acute exposure to hyperglycaemia , chronic ER stress leads to a decrease in insulin synthesis and activation of the apoptotic cell death programme . NEFA have been recognised as key contributors that can trigger the apoptotic programme, in part mediated by the ER stress response, and this highlights the significance of obesity and nutrients in the context of lipotoxic effects on beta cells . Among other ER stress-related proteins, the spliced form of X box binding protein 1 (XBP1s), a protein involved in IRE1 activation, has been reported to regulate both alpha and beta cell function. Mice with alpha cell-specific disruption of XBP1 expression (alpha-XBP1KO)  exhibit altered glucagon secretion as a result of increased ER stress that is not directly associated with alpha cell mass or growth. Surprisingly, prolonged XBP1 overproduction in rat islet cells impaired glucose-stimulated insulin secretion, BAX (BCL2-associated X protein) translocation, cytochrome c release and activation of caspase 3 and beta cell apoptosis . However, sustained production of XBP1 inhibits beta cell function and eventually triggers the mitochondrial pathway of apoptosis, probably secondary to inhibition of PDX1 and musculoaponeurotic fibrosarcoma oncogene homologue A (MAFA) expression . In summary, ER stress and its related proteins seem to affect beta cell mass by inducing apoptotic death, while alpha cell mass remains relatively normal. Mitochondrial dysfunction and, consequently, increasing oxidative stress with age are responsible for reduced beta cell function and survival . Several growth factor pathways including insulin have been reported to modulate mitochondrial function and regulation of oxidative stress leading to beta cell apoptosis. The presence of a complex between the pro-apoptotic protein Bcl-2-associated death promoter (BAD) and glucokinase in mouse and human beta cell mitochondria may play a role in this process and contribute to defects in mitochondrial function . It is important to note that a majority of studies exploring the capacity of endogenous renewal have been performed in young rodents and cannot be directly translated to an equivalent age in humans. For example, partial pancreatectomy in rodents promotes beta cell regeneration and increased insulin content . In contrast, in one report, adult humans who underwent partial pancreatectomy did not exhibit evidence for increased regeneration  but exhibited long-term recovery of beta cell function . In addition, the dramatic age-dependent decline of pancreatic beta cell replication in response to diverse insults (high-fat diet, streptozotocin administration or short-term treatment with the GLP-1 analogue exendin-4) has been correlated by Tschen et al  with an increase in Bmi1 levels, a polycomb group protein that regulates the Ink4a locus and modulates the ability of the beta cell mass to expand. Interestingly, a systemic factor has been considered responsible for increasing the proliferation rate of old pancreatic beta cells when parabiosed to young mice . Whether this factor is similar to the circulating factor in insulin-resistant states  has not been fully explored. New therapies are urgently required to restrain beta cell death and promote beta cell function and regenerate healthy functional beta cells in diabetic patients. To date, several growth factors and transcription factors have been highlighted for their ability to increase beta cell mass and proliferation based on elegant genetically engineered transgenic and knockout approaches in rodents. However, the poor translation of the beta cell proliferative effects of potential factors and small molecules observed in young rodent to humans underscores the poor state of knowledge of signalling pathways in human beta cells [8, 148, 149] and urgently calls for a major scientific effort in this area. Investigating the modifications that occur during the ageing process provides a unique opportunity to identify possible targets to prevent and slow the progression of diabetes, and to maintain higher rates of proliferation and regeneration of insulin-producing cells in pathophysiological conditions. Current studies suggest that potential induction of replication of adult beta cells, neogenesis from progenitor cells and duct cells, transdifferentiation from alpha to beta cells and de-differentiation of beta cells are plausible mechanisms that could be harnessed to engineer a therapeutic increase in insulin-producing cells in humans. It will be exciting to see whether one or more of the aforementioned mechanisms, or perhaps a new discovery, holds the key to safely and specifically enhancing functional beta cell mass to treat diabetes. We thank E. Dirice (Joslin Diabetes Center, Boston) and S. Kahraman (Joslin Diabetes Center, Boston) for providing islet pictures. RNK acknowledges support from National Institutes of Health Grants RO1 DK67536, RO1 DK055523 and a grant from the Juvenile Diabetes Research Foundation. TM acknowledges support from Reynolds Travel Fellowship by European Association for the Study of Diabetes and Fellowship Prize by the Società Italiana di Diabetologia and the European Society for Clinical Nutrition and Metabolism. The authors were involved in the conception and design of the manuscript, drafting the article and revising it critically for important intellectual content. TM designed all illustrations. RNK and TM edited the manuscript and approved the version to be published.